Today I took part in a great campaign that supports Indian farmers. Seed The Rise Campaign – a crowd funding initiative set up by Mahindra – helps improve the lives of Indian farmers who have been betrayed by the bad weather. Working with 5 NGO-led projects across India, the campaign is looking to raise Rs. 2 crores in public donations. What’s more – each donation will be matched by Mahindra to double the benefit for the farmers. As a part of this initiative, I was asked to create a recipe with an ingredient that India grows in abundance – chillies. As a fan of hot, spicy food myself and growing up in a Mangalorean household has helped me appreciate different kinds of chillies that are available in the market. My grandma and I would spend Saturday mornings at our local Fort Market in South Bombay to source ingredients for the week. We’d buy dried shrimp, fresh coconut, spices and all sorts of things. My most favourite part was visiting the spice section where one of the stalls had different kinds of chillies hung from the ceiling. There were long thin ones to stubby ones and every chilli had a unique flavour. Yes, chilli has flavours. We’d buy what we need and make our way home. Then came the best part. Back home, my grandma would lay out all the spices and wrap them in different paper bags and store them in aluminium containers which had seen several decades. Saturday was well spent. When I had to choose the chilli to cook my dish, I decided to go with something that is closer to my roots – Gundu Molzuka. You’ll see this being used in a lot of Chettinad dishes and also in sambar. I went traditional with my selection but went completely different when cooking with it. 1. In a small bowl, add some water and soak tamarind in it to extract its pulp. Once the tomato is cooked for about 4 minutes on a medium heat, add tamarind pulp. Remember to fish out the tamarind seeds, skin and to add only the liquid. Once you’ve done that, add the rasam powder, chilli powder, chopped coriander and stir well. 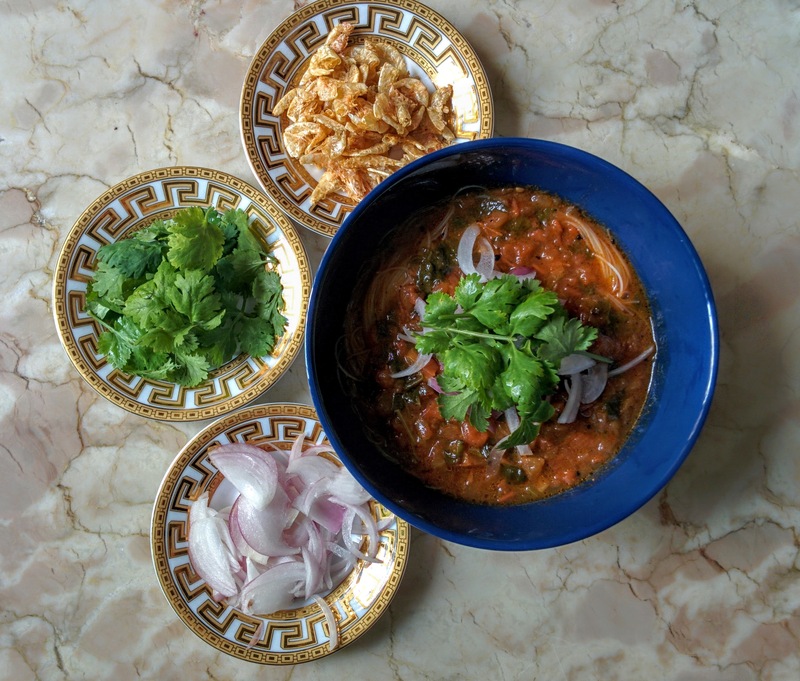 When your rasam and noodles are ready, it’s time to assemble. In a bowl, add the noodles and spoon over the rasam. Serve piping hot with assorted condiments close by. 1. 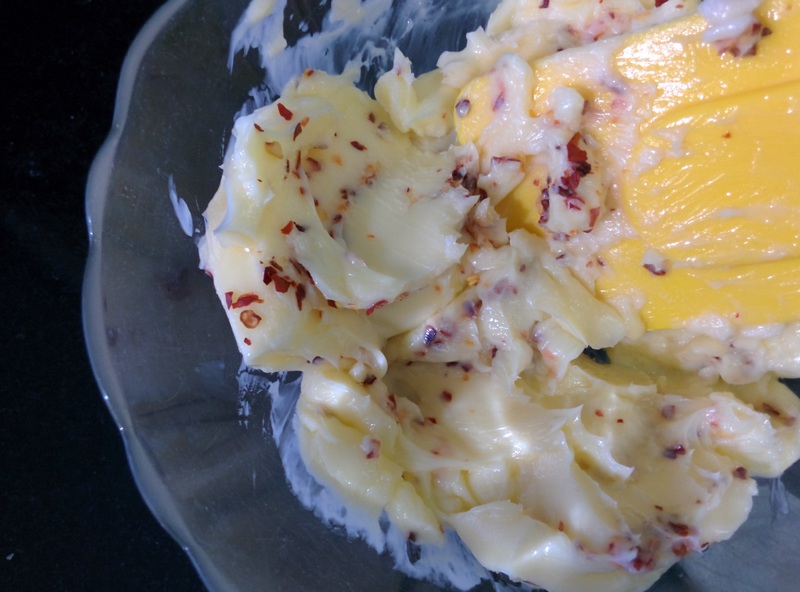 Take butter out of the fridge and let it gradually come up to room temperature. 2. Grind a couple of these chillies to flakes and add to the soft butter. Season with salt and mix well using a spatula. 3. Tear a foot-long sheet of baking paper and fold it in half lengthwise. Transfer the chilli butter to the sheet along the fold line and spread it out evenly. 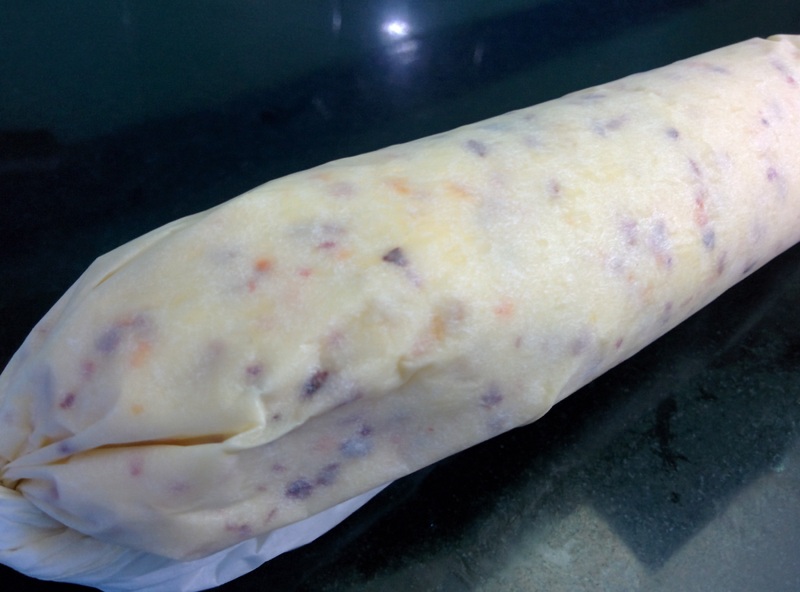 Fold the baking paper again and try to create a tube of butter carefully. 4. Wrap it well and freeze it before use. Every time you want to use it, you can slice discs of this butter and add to pasta, meats or anything that needs a spicy kick.